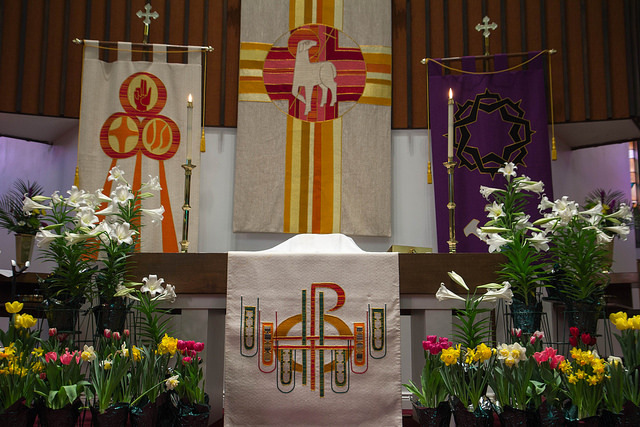 Ground Goes Boom: A sermon for Easter Morning. Silence. Then noise. Noise. Then silence. When I lived in New York City, I craved the noise of the city street. On warm days like today, I loved to open the windows of my 5th floor walk up apartment and just listen to the traffic below. I would hear my neighbors, sitting on their fire escapes, talking to one another in languages I didn’t understand. And, just down the block, the Piragua man would be telling jokes while he shaved a block of ice to make a young child a delicious treat. But now, as a parent with two young children, my need for noise has changed. The traffic of city streets below my apartment window has been replaced by the sounds of plastic cars being launched off my dining room table. The words of my old neighbors are now overwhelmed by words from new neighbors led by a cartoon tiger named Daniel with his friends the Power Rangers, Peppa Pig, and Thomas the Tank Engine I now long for those seconds of silence I’m able to scrape together when the rest of my family are busy playing on the other side of the house. The sounds that fed my soul in the past do not necessarily feed me now. Sometimes, I need the noise of a loud city street to remind me that there is life in this world. And sometimes I need a bit of silence to remember all the life there is in me. We live our entire lives surrounded by cycles of noise and silence. When we’re in the womb, the rushing sound of blood pumping through our mother’s veins is as loud as a running vacuum cleaner. And when we’re a little older, one of the first skills we learn is how to sleep through the silence. We don’t always get to choose the silences and the noises that surround us. But we do learn how to live through them. The noise and the silence makes a rhythm we live out each and everyday. And that rhythm can bring us meaning, if we only learn to look for it. When we listen to the gospel according to Matthew, we hear a rhythm of noise and silence that is the heart of Jesus’ story. When Joseph, Mary’s fiancée, finds out she’s pregnant, he wants to break up with her but he plans to do so quietly. God changes Joseph’s mind by sending him a very noisey dream filled with words from an angel. As Jesus grows up and begins to teach about God’s vision for the world and what God’s love actually looks like, his teaching and healings are met with a silence filled with confusion, fear, and jealousy. When Jesus is finally arrested and interrogated by the Roman Governor, Pontius Pilate, Jesus stays silent. He doesn’t answer many of Pilate’s questions. Even the soldiers, when they are mocking him while he hangs on the Cross, get no real response. The rest of the world rages but Jesus…doesn’t. Instead, when death finally comes, the weeping of his disciples and the grumbles from the guards posted outside his grave cannot penetrate the stone walls of his dark tomb. For 3 days, quiet surrounds Jesus. For 3 days, he knows death. And then, once the sabbath day is over, a group of women leave the city. Since it’s before dawn, the city is still asleep. The terror and sadness of Jesus’ death still hung in the air. The women want to finish the traditional burial rituals for their friend. And I imagine, as they walked, they stayed quiet. They didn’t dare break the silence with even a whisper. So God, with an angel and an earthquake, breaks that silence for them. Now, Matthew does something different in his telling of the resurrection. Not only do the women feel the ground shake, they hear the grinding of stone as the angel opens the tomb. They watch as professional soldiers faint in fright, their armor and spears clattering as they hit the ground. And, just in case that wasn’t enough, the angel, sitting on the rolled away stone, speaks. The silence of death isn’t broken only by seeing an empty tomb. That quiet is shattered by an earth that moves and bellows. Soldiers from the greatest military power in the world, fall over; their weapons clattering and announcing the failure of their power. These women followers of Jesus, disciples who clung to his teaching, heard his promises, and saw him die – they are having their expectations undone. The silence of pain they carried with them is being broken. The noise of the world is being undone by the love of God. And it’s after the ground moves and the earth shifts when the silence of death is finally undone by something very human and very soft. It’s merely a voice that shares the message. It’s a word that announces the promise. The angel says “Jesus is not here.” And with that, the rhythm of the world is undone. The women expected death – but now, only new life remains. We know the noises that make up the rhythm of our lives. And it’s sometimes easy to point to the loud and over the top sounds that other people can also hear. But there are those noises that keep us silent. There are those thoughts and fears and concerns that stay with us, in our hearts and in our heads, never letting us go. They are the weights we carry on our shoulders and the troubles that burrow into our souls. They are the worries, anxieties, fears, and sadness that make us feel less than whole. No one else might hear the noises we hear. But they are loud. And they can push out hope. But they can’t push out God – because Easter is when the noises we know and silences we live through are met by the love and promise of Jesus Christ. Because God decided that creation was worth living in. God decided that the sick, the poor, the outcasts, those who are afraid, and those who are weighed down – are worth friendship, healing, and love. The rhythm of noise and silence that makes up our lives will not be our final story. There is a new rhythm in our reality that God has already written. It’s a rhythm where the noise of this world is replaced with the noise of hope, generosity, and love. It’s a way of life where service to others is a language everyone’s speak. It’s a reality where our pains, our sickness, and our sorrows are embraced by Jesus Christ because you are worth more than any of the silence that has been imposed on you. Your rhythm of noise and silence, of fear and hope, is now in the hands of a God who does not let the silence of death win. Today we celebrate Easter. Today we remember that the rhythm of this world has already been changed. We celebrate the gift of God’s love that makes a difference now. Because Jesus did more than conqueror death; he lived through our noises and our silence and wrote us a new ending that will not be contained in a tomb.